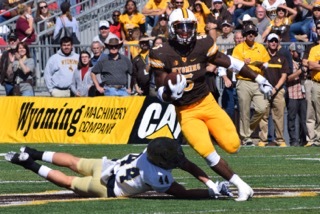 University of Wyoming junior running back Brian Hill has been named the Mountain West Conference Offensive Player of the Week for his performance last Saturday in a 42-34 Wyoming win at Nevada. Hill posted the best single-game rushing performance of the season in the Mountain West and the second best rushing performance in the nation this season when he ran for 289 yards against Nevada. 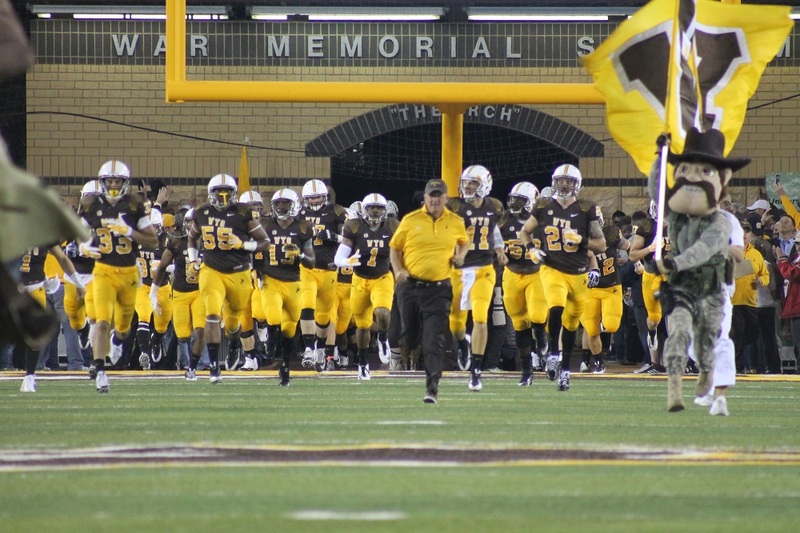 His performance was also the second best single-game rushing performance in University of Wyoming school history and was a personal best for Hill. He also accounted for 302 all-purpose yards versus the Wolf Pack, which ranks as the eighth best single-game performance in the nation this season. The junior from Belleville, Ill., averaged 10.0 yards per carry on 29 carries. He scored a personal best three rushing touchdowns in the win over Nevada. His TD runs were for 56, 2 and 20 yards. His previous single-game high was two rushing TDs. Hill recorded nine rushing plays of 10 yards or more against the Wolf Pack, including runs of 41, 56, 15, 11, 10, 20, 17, 20 and 39. Hill has also now achieved his second 1,000-yard rushing season, as he enters this week with 1,010 rushing yards this season. He enters this week ranked No. 2 in the nation in both total rushing yards (1,010) and average rushing yards per game (144.3 yards per game). Hill also earned MW Offensive Player of the Week honors as a freshman in 2014 for his performance at Fresno State and as a sophomore in 2015 for his play versus UNLV. For the Cowboys, it is their third MW Player of the Week honor of the season. Redshirt sophomore quarterback Josh Allen was named MW Offensive Player of the Week for his performance in Wyoming’s triple overtime win over Northern Illinois. Sophomore free safety Andrew Wingard was named the MW Defensive Player of the Week following the Cowboys’ win over Colorado State. It took all summer, but we finally got out to do a little fishing and other outdoor fun over the long Labor Day weekend. I just wish we’d had more free weekends before this one.